Galaxy Confections has announced the launch of two new products under the Galaxies brand: Chocolate Covered Malted Milk Balls and Peanut Butter Malted Milk Balls. Rhythm™ Superfoods has introduced Sweet Potato Chips, made with organic sweet potatoes and fresh ingredients. Rhythm Superfoods Sweet Potato Chips have the appeal of a crunchy potato chip minus the fat. High in fiber, potassium and Vitamins A and C, sweet potatoes are known as one of the world’s most perfect foods, and when air crisped using Rhythm™ Superfoods signature form of preparation, make a great snack. Nathan’s Famous Angus Beef Franks have arrived in a 14-oz., seven-link package with a black label to signify black Angus beef. The suggested retail price is $5.99. Davidson’s Tulsi Tea is about to arrive in U.S. grocery stores. Davidson’s Tulsi is traceable all the way back to its source—the company’s own organic tea farms in India. Tulsi, a type of basil, also known as Holy Basil, has been revered in India as a sacred, health-promoting herb for 5,000 years. Each of the six unique flavors—Signature Blend, Pure Leaves, Rooibos Chai, Spicy Green, Hibiscus Flower and Chamomile Flower—is perfect for sipping, icing or blending into specialty drinks and cocktails. Campbell Soup Co. is expanding its V8 franchise by entering the energy drink category with two new products: V8 V-Fusion + Energy drinks and V8 Energy Shots. The new beverages provide healthier alternatives to most energy drinks on the market today, and are made with ingredients that people know and trust. Each beverage provides one combined serving of vegetables and fruit as well as a natural energy boost from green tea extract. V8 V-Fusion + Energy drinks are made with a blend of ­vegetable and fruit juices plus natural green tea. Each single-serving can contains 80 milligrams of caffeine, comparable to the leading energy drink on the market. The drinks are 50 ­calories, provide an excellent source of B vitamins and do not contain added sugar. V8 Energy Shots are a naturally powered shot of 100 ­percent vegetable and fruit juices combined with green tea ­extract, which provides natural caffeine comparable to an 8-oz. cup of the coffee. The 2.5-oz. shots also are nutritious with a unique blend of nine vegetable and fruit juices. V8 V-Fusion + Energy drinks are available in 2,400 Walmart stores beginning this month. The drinks are available in 8-oz. slim cans in two flavors—Pomegranate/Blueberry and Peach/Mango, for $3.98 for a six-pack. Genesis Today has introduced Wake Me™ and Relax Me™, two new beverages that leverage Mother Nature’s superfoods to support healthy energy and relaxation. Genesis Today Wake Me and Relax Me are available ­exclusively at Walmart stores nationwide in the refrigerated juice and beverage section. Wake Me offers an energy lift in the morning and ­throughout the day with a blend of vitamins and nutrients in a ­tangerine-­orange juice. CLIF Kid®, maker of organic snacks for kids, has launched its new Zbar Crispy, an organic rice crispy snack. CLIF Kid also introduces a new Fruit Punch flavor for Zfruit, a fruit rope twist made with ­organic fruit puree. The Zbar Crispy is made with 8g of whole grains and a ­sprinkling of toasted oats for a light crunch and comes in three ­flavors: Chocolate, Chocolate Chip and Peanut Butter. CLIF Kid Zfruit is an organic fruit snack equivalent to one serving of ­organic fruit. Fruit punch joins Zfruit’s other flavors in Mixed Berry, Sour Apple, Strawberry, Tropical Twist and Grape. Swiss chocolatier Lindt is taking dark chocolate to the next level with the introduction of two new Excellence bars: Excellence 70 percent Cocoa Almond Brittle and Excellence 70 percent Cocoa Nut Crunch. The new Excellence 70 percent Cocoa Almond Brittle is a crunchy almond brittle with a deep flavor of dark chocolate. The Excellence 70 percent Cocoa Nut Crunch has a crunch of caramelized walnut and hazelnut pieces paired with dark chocolate. General Mills now offers a wholesome option to traditional brownies with Fiber One® 90-Calorie Brownies. Each brownie contains 5g of fiber. They are available in Chocolate Fudge and Chocolate Peanut Butter varieties. The chocolate fudge brownies are made with chocolate-flavored chips and topped with dark chocolate drizzle. The chocolate peanut butter variety contains peanut butter-flavored chips and is topped with a peanut butter drizzle. Marley’s Mellow Mood is a new line of relaxation beverages that is made of 100 percent natural teas and sodas that are designed to reduce stress and relieve tension. Created in partnership with the family of Bob Marley, Marley’s Mellow Mood is available in two varieties: lightly carbonated sodas which are packaged in 12-oz. Rexam SLEEK® cans, and ready-to-drink teas. Both are formulated with a blend of calming and stress-reducing ingredients ­including chamomile, valerian root, passionflower, melatonin, rose hips and lemon balm. 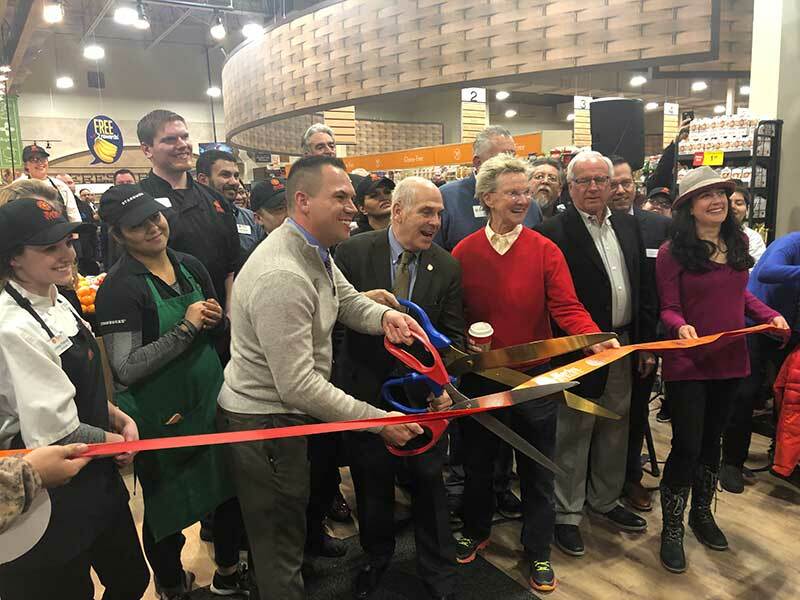 With nearly 80 percent of consumers buying a potato product on a regular basis, Santa Barbara Bay’s new Tater Toppers provides a whole new potato experience, a one-stop shop for flavor that can be savored. The seven distinct varieties are Loaded Potato, Bacon Ranch, Butter and Herb, Chili Cheese Fries, Broccoli Cheddar, Wasabi Ranch and Four Cheese & Roasted Garlic. Tropicana Trop50 has introduced Lemonade and Raspberry Lemonade. These new varieties have 50 percent less sugar and calories, and no artificial sweeteners. Capitalizing on the increasing interest in U.S. Southern regional cuisines, Simply Organic® is capturing the flavors of The French Quarter by adding five new gluten-free seasoning mixes: Red Bean, Black Bean, Dirty Rice, Jambalaya and Gumbo Base. All of Simply Organic’s New Orleans-style mixes are third-party certified as ­organic, kosher, gluten-free and are also vegan. Simply Organic’s New Orleans-style Seasoning Mixes require only two or three common ingredients and can take less than 10 minutes to prepare. Earth Balance®, a line of buttery spreads, shortenings, nut butters and soymilk has introduced its new Organic Coconut Spread and MindfulMayo™ Dressing and Sandwich Spread nationwide. The Organic Coconut Spread will be available exclusively at Whole Foods Market. 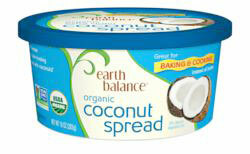 Earth Balance Organic Coconut Spread offers a convenient, affordable way to incorporate coconut oil into the diet. Earth Balance MindfulMayo Dressing and Sandwich Spread is cholesterol-free, egg-free and dairy-free. It is available in Original, Extra Virgin Olive Oil and Organic. 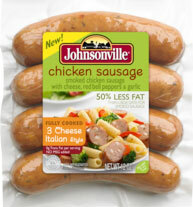 Johnsonville Sausage has introduced Chicken Sausage, featuring 50 percent less fat but 100 percent Johnsonville taste. 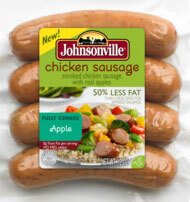 Available in three varieties—Apple, Three Cheese Italian Style and Chipotle Monterey Jack Cheese—Johnsonville Chicken Sausage is now available in select retailers nationwide. seasonings. 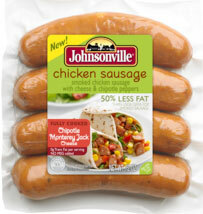 Chipotle Monterey Jack Cheese includes smoked chicken and savory Jack cheese, accentuated by chipotle pepper. Land O’Frost is expanding the availability of its newest product, the Land O’Frost Wrap Kit, to store shelves across the U.S. The new Wrap Kit provides consumers with a solution for quick meals. 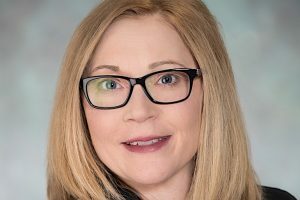 Initially rolled out to test markets in January of this year, the Wrap Kit has received positive consumer feedback and has decided to expand the product’s distribution nationwide. The Laughing Cow® now has two new flavors of Mini Babybel®: White Cheddar and Sharp Original. The new varieties join Mini Babybel’s portfolio of natural, wax-wrapped, portion-controlled snacking cheeses that ­include Mini Babybel Original, Light, Gouda, Cheddar and Bonbel. Skinny Batches is a baked goods company ­specializing in producing bite-sized, guilt-free goodies. 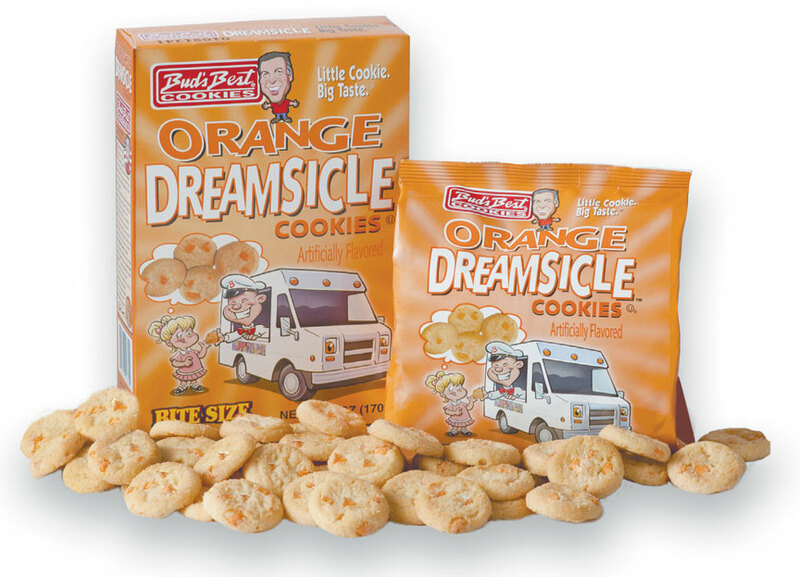 All products have zero trans fats, no preservatives, and no high fructose corn syrup. All are nut free; some are soy and dairy free as well. Skinny Batches currently offers three categories of products: Crumbies, Cookies and Gingerbread. The Crumbies are a combination of a coffee cake and a muffin. Every flavor begins with a unique specially made fruit butter. Each Crumbie has just 45 calories. They are available year-round in Banana, Chocolate Banana, Pear, Coffee, Mocha and White Chocolate Berry flavors. Seasonal flavors appear. Crumbies come six to a pack; SRP is $7.99. The Skinny Batch Cookies include Oatmeal, Salted Janets and SkinnyDoodles. The cookies are 45 calories each, 12 per bag. SRP is $9.99. Alexander Keith’s has announced the U.S. launch of three new brews: Nova Scotia Style Lager, Nova Scotia Style Pale Ale and Nova Scotia Style Brown Ale. The beers are now available in 22 states across the U.S. The Nova Scotia Style Pale Ale also includes a fruity, spicy and ­citrusy hop nose. The Nova Scotia Style Brown Ale is a classic full-bodied brown ale with hints of honey and caramel. Chaska, Minn.-based The Village Co. introduces two new products from the creators of Mr. Bubble® Bubble Bath. The Mr. Bubble Fizzy Bubble Bomb is shaped like the Mr. Bubble character. The Original Bubble or Bubbleberry scented bath bombs provide extra-long-lasting fizz in the tub. Available in pink or blue, they also add bubbles and color to the bath water. The mixed shelf display tray holds 12 fizzy bubble bombs. Each fizzy bubble bomb is sold separately with a suggested retail price of $1.49. This summer the Nestle Drumstick brand is “sprinkling” in some fun with new Drumstick Sprinkled! sundae cones. They are available in three flavors—Vanilla, Chocolate and Vanilla Cherry—and coated in chocolate and crunchy sprinkles. Drumstick Sprinkled! sundae cones are available now nationwide with an SRP of $6.99 for a box of eight cones. Kellogg Co. introduces Keebler® Granola Fudge Bars. Made with oats, rice, honey and real Keebler® fudge, the new bars are a good source of fiber (3g), have 10g of whole grains and have no high fructose corn syrup. Keebler Granola Fudge Bars are a great snack for the office, at home or on the go.